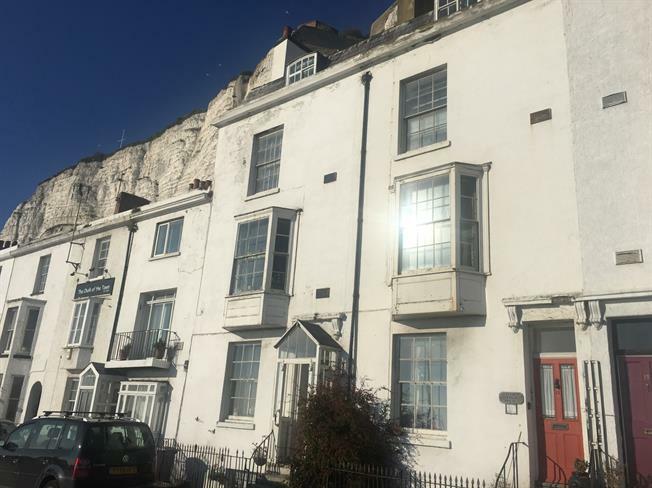 Terraced House For Sale in Dover for Offers in the region of £200,000. Requiring extensive renovation, this wonderful period property could be something spectacular and provides a lot of opportunities. Spread over 5 storeys, you are not lacking for living or sleeping space. It has formerly been divided into flats so, with the relevant permissions, this is a potential conversion option. It is currently laid out with 4 bedrooms, 2 bathrooms and 3 reception rooms but could easily be adapted to include 6 bedrooms and extra living space in the basement. Single Glazed wooden front door. Carpeted flooring, dado rail. Secondary glazed wood sash window facing the front overlooking the sea. Gas fire, chimney breast, carpeted flooring, picture rail, ceiling rose. Single glazed wood sash window. Carpeted flooring, picture rail and chimney breast, ceiling rose. Part tiled walls. Roll top work surfaces, fitted wall and base units, stainless steel one and a half bowl sink, freestanding electric oven, integrated gas hob, space for freestanding fridge. Single glazed wooden back door opening onto the garden. Single glazed wood windows overlooking the garden. Tiled flooring. Single glazed wood sash window facing the rear overlooking the garden. Carpeted flooring, dado rail. Secondary glazed wood box bay window facing the front overlooking the sea. Gas fire, carpeted flooring, chimney breast, ceiling rose. Double bedroom; secondary glazed wood sash window facing the rear overlooking the garden. Chimney Breast. Carpeted flooring. Double glazed uPVC window and single glazed wooden window. Heated towel rail, vinyl flooring. Standard WC, single enclosure shower, pedestal sink. Carpeted flooring. Single glazed wooden sash window facing the rear. Double bedroom; secondary glazed wood sash window facing the front overlooking the sea. Gas fire, carpeted flooring, chimney breast. Single glazed wood window. Vinyl flooring, boiler. Inset circular sink. Secondary glazed wood sash window facing the rear overlooking the garden. Heated towel rail, carpeted flooring. Standard WC, panelled bath, top-mounted sink. Double bedroom; single glazed wood window facing the rear overlooking the garden. Carpeted flooring, built-in storage cupboard, chimney breast. Wooden door. Single glazed wood sash window. Gas fire, tiled flooring.